Henoko Tug-of-War on August 30 in Henoko, Nago City, residents and U.S. soldiers shared in the excitement of the ‘fire sparks’ of Tebigae. 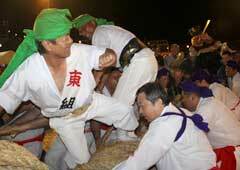 On August 30 at the Henoko Ground in the Henoko district of Nago City, a traditional tug-of-war event was held. Participants in the Henoko tug-of-war were divided into two groups, east and west, and faced off twice. The East group won the competition, after winning in the first attempt, and drawing in the second. The event was held for the first time in three years thanks to the efforts of an executive committee, a youth group, and associated groups. Despite rain pouring down in the middle of the event, about 2,500 people, more than the population of the district, turned out for the day and were psyched up for the tug-of-war. The East team　steadily pulled on the rope, winning the first match of the tug-of-war . The event began with a performance by a band from the U.S. Marine Corps Camp Schwab. Calling “Wasshoi wasshoi,” a children’s group, a student’s group, and pupils from Yamabiko Kube Preschool, marched with a portable shrine. Parents smiled and waved at them. During a traditional Eisa performance by the youth group, a heavy rain fell. However, performers persevered and kept dancing, the strong beat of the drums never stopping. Also on the stage that day, was a powerful performance of Bojutsu (martial arts with a stick). 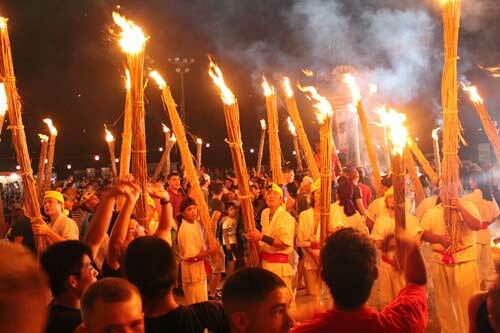 Tebigae, a ceremony in which young men with a flaming torch run to form a circle, brought much excitement to the event. Residents and U.S. servicemen ran into the circle together, yelling “Sa sa sa” as they flicked fire spark off. While the sound of shell trumpet and a blaring tritons trumpet worked up the crowd, a male rope and a female rope were linked with a Kanuchi stick, kicking off the tug-of-war. The East team steadily pulled the rope and won the first game. In the second match, neither side gave up and it ended in a draw.